All across Kendal, pubs that for years served the beer-faithful of Kendal, are slowly closing down and standing empty. Recently, a couple of these historical drinking holes have been taken in hand and renovated, breathing new life into buildings that would otherwise have stood empty and unused. One of the most recent additions to this club, is the Masons Arms, situated at the Western end of Stramongate. Above. The Masons Arms in 'days gone by' and as it appears today!! The inn and most of Yard 26 next door, once formed Ralphord Hall. This spectacular three storey building was once a town house. It's marked on a map of 1777 as a residence, though there's not much information about who built it or who lived there before it became an inn. In 1908, architect James Hutton was employed to make some cosmetic changes to the front of the building, resulting in the layout we see today. The rear of the inn was apparently not included in his commission, and apparently remains as it was when originally constructed. 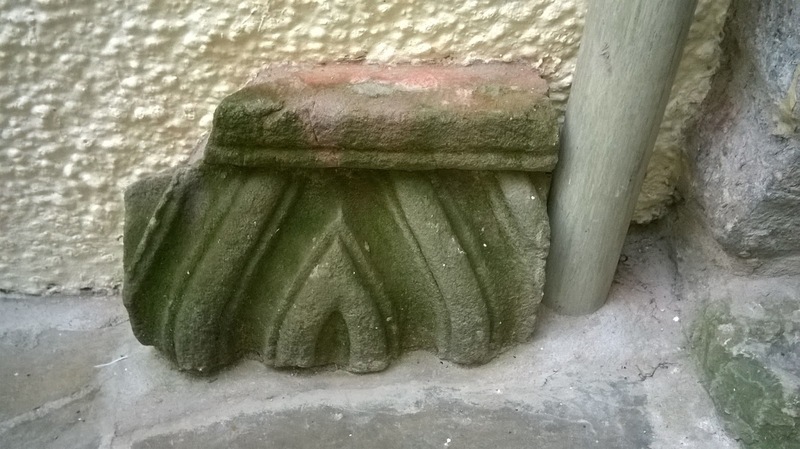 The sign that was originally hung at the front of the building, has almost the same coat of arms on it as the Freemasons of Gateshead and Tyne, used from somewhere around 1671. Above. The sign has been saved and is now on show down the yard. The original sign, seen in some black and white photos, showed two freemasons working. This sign was replaced in the 1970s, and thankfully for us, has not been discarded, but instead can now be seen down the yard that runs alongside the inn. Records dating from 1882, show that the yard once led directly into the grounds of the Unitarian Chapel at the top of Branthwaite Brow, possibly indicating the high status of the residence....giving the occupants of Ralphord Hall direct access to their regular place of worship. This direct access to the chapel was eventually blocked in 1900. Thomas Gibson, once owner of Ralphord Hall, died in 1781, and gave the building over to the Ralphord Hall trustees, specifically for use by the Protestant Minister of the area. This was his to use in return for a small rent, payable annually to the Blue Coats Hospital in the town. The first licensee of the Masons Arms, is shown in records, to be Thomas Derome, in 1826. Records from 1892 tell us that the inn had stabling for ten horses, two drinking rooms, two bedrooms and one dining room that had seating for fifty people. In 1997, under the ownership of brewers Whitbread, the inn underwent major refurbishment. However, more recently, with changing habits in drinking habits, the Masons Arms succumbed and was closed down. 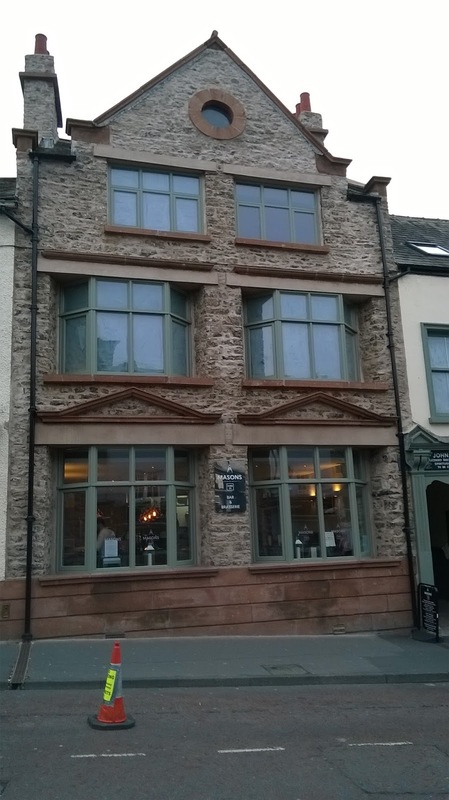 The subsequent renovation and refurbishment has been spectacular, and it's great to welcome the inn back onto the drinking scene in Kendal again. 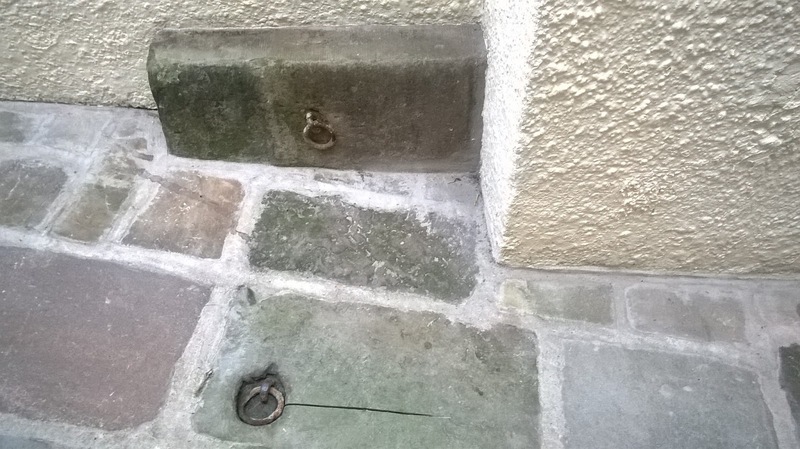 A recent visit, and an inevitable trip to the loos, revealed these small pieces of masonry, hidden down the yard next to the inn. The first finds could well be tethering blocks from the inns days as a coaching inn. One is set into the wall and the other is set into the floor, and both still have their iron rings still attached. If they're not tethering blocks for horses, they could have come from the nearby shambles, where animals were butchered. The other pieces of masonry are both set into the walls, and have been used to protect the downspouts. 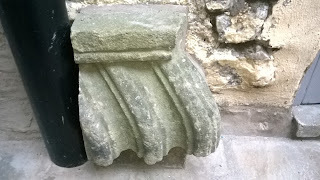 I'm not sure what these two pieces of stone represent, what they were, or even if they're contemporary with the original building here....or possibly from elsewhere in Kendal....perhaps Kendal Castle? Who knows?